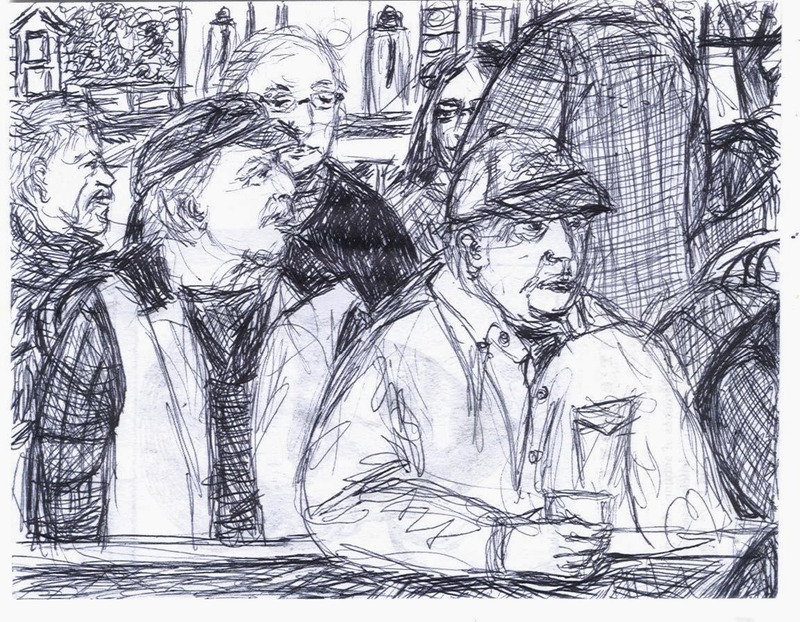 Bridget Galway's Portrait of the Bagel Bards " a fine piece of the morning" Click on picture to enlarge. It is Krikor, and Dennis has the cup in his hand. 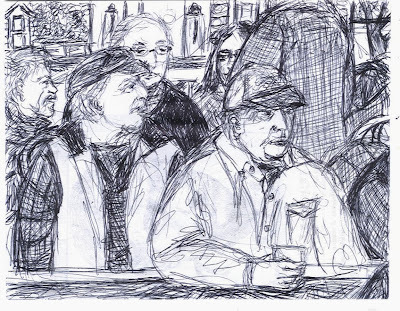 Later in the morning I ended up in a long discussion with the man in the drawing who is in profile behind Krikor. He usually wears a canvas brimmed hat, and carries a colorful woven bag. Our discussion was inspired by Baudelaire. I am blanking on his name. He sometimes comes in with his wife, her name is Rachael. It was good to get to know him, names often times come secondary. The figure behind Dennis is Harris's blazer, The man with the glasses at the table in the background, and the peak of the face of a woman, is the couple that just recently moved from New York City to Boston, and I think are new Bard members. This inclination to capture my social milieu while in it, is few and far between, and it comes unexpected, rendered by intuition, and therefore full of life.